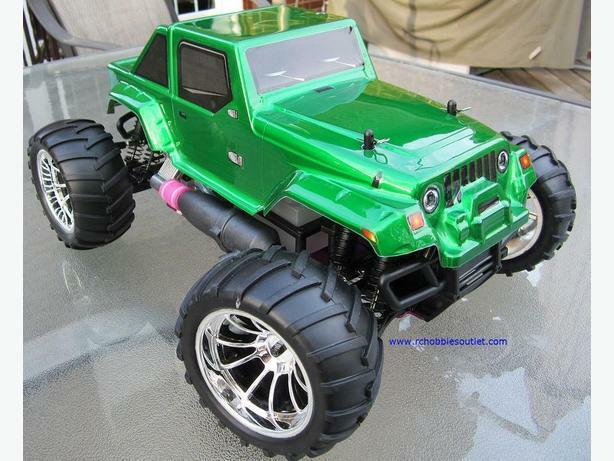 This Radio Control RC Monster truck boasts a powerful .18 Nitro engine, heavy duty suspension, 4 wheel drive, and huge soft compound RC off road tread that?s sure to trample the toughest terrain. When you pull the trigger on the controller , and the nitro gas engine propels you across the track -- your friends will be amazed at the performance and value of this RC truck. Please see www.rchobbiesoutlet.com for more details. This RC Truck comes with a 2.4G radio for longer range, no crystals, no external interference and no interference from other RV vehicles. The intelligent digital radio automatically switches between different channels so you will never have a truck on the same channel. Not to mention no aerials to snap on the RC truck or the transmitter. We stock all the spare parts as well as the Factory hot up parts so you can trick the RC truck to your specifications. It is ready to run -- just add fuel and batteries and you can literally go out and start winning races tomorrow. This RC Truck comes with a 12 month warranty against any manufacturer defects. Fast, low cost shipping is available to your area.